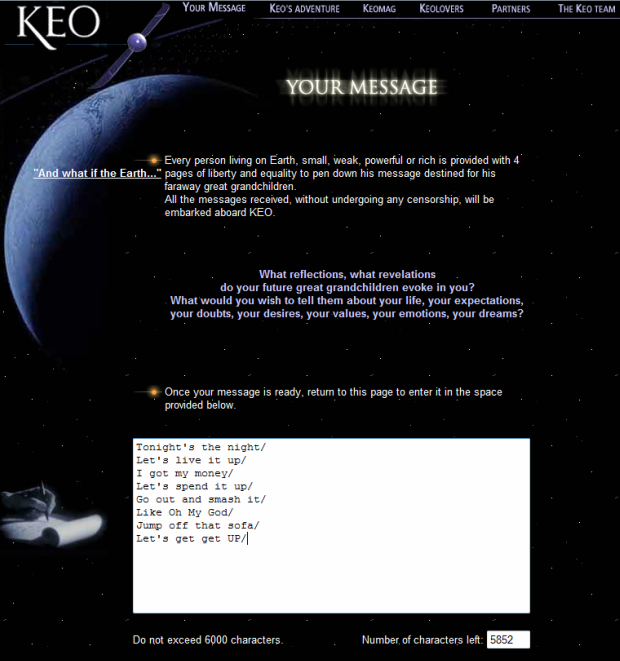 Hurry up, sports fans, for today’s the last day you can submit a message to the KEO space capsule. The idea is to have a bunch of people write an epic message, then in 50,000 years it’ll return and give future people the messages. I have no idea how any of this works, so please direct your WTFs somewhere else. What does fascinate me is the idea that the countries, languages, cultures, etc. that are around today will be around in 50,000 years to read the capsule when it returns. (All messages will also be made available over the Internet, anonymously, so it’s not like you’ll have to wait 50,000 years to read what people wrote. It’s just that the spirit of the project is a hard copy time capsule of sorts.) How long did Rome last? Isn’t China one of the oldest continuous civilizations on Earth, and it only clocks in at a few thousand years, nowhere near 50,000. Will people be able to read English and Spanish and Arabic (and so on) in 50,000 years? Will anyone care that Dream just beat Sengoku at the Dynamite!! show in Tokyo on New Year’s Eve? I don’t know, it’s just that 50,000 years is a pretty long time on the timeline of human history. One thing’s for sure: if people are still around in 50,000 years even they won’t have flying cars.